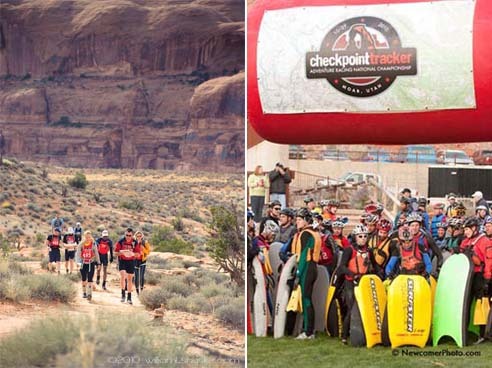 With a course designed by Gravity Play Sports, and a venue in and around the Martian wonderland of Moab, Utah, the inaugural Checkpoint Tracker Adventure Racing National Championship wrapped up last weekend, on October 30, 2010. The endurance-sports freakshow featured 178 competitors divvied up as solo racers and on about 50 teams. 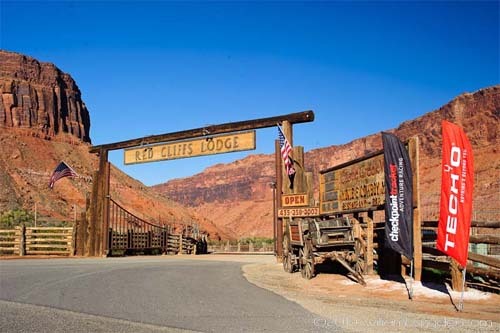 Kayaking, riverboarding, trekking, mountain biking, climbing, and navigating were all part of a 110-mile multisport course through the desert, across Moab’s famous slickrock domes, and into the mountainous terrain above the town. A $10,000 cash prize purse was split among the top three teams, which were not officially announced by the race organization until a few days after the race ended, on November 3rd. The winners — and most competitors in the event — braved a 350-foot Tyrolean traverse, whitewater “swimming” (on riverboards), and a nonstop, sleepless course that had a time cutoff of 28 hours. 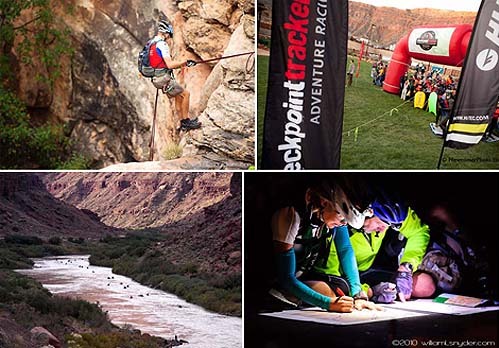 The winners of the Checkpoint Tracker event received $5,000 in cash and a load of gear from Hi-Tec, Tech4o, SOG Knives & Tools, and MyTopo.com. The second- and third-place teams — Team DART-nuun-SportMulti and Team Gore-Tex — respectively won $3,000 and $2,000 plus custom gear packages. First place Team Odyssey Adventure Racing-IMONPoint.org crossed the finish line at 5:19am last Saturday after 21 hours and 19 minutes of race time. Two other squads — Team Osprey Packs and Team YogaSlackers — had actually blazed through the finish line more than two hours earlier that morning, completing the entire course and believing they had handily taken first (Osprey Packs) and second (YogaSlackers) in the race. But an interpretation of the rules during one section of the race resulted in significant penalties to Osprey Packs and YogaSlackers, eventually sending the teams back to 7th and 10th places overall. “We were dumbfounded with the penalty,” said Jason Magness, captain of Team YogaSlackers. Magness’ team, as well as Team Osprey, took an alternate (though not shorter) route through one section of the race course. “We had clarified the strategy with a race volunteer on an ambiguous rule about the order to obtain checkpoints, but we got punished for our interpretation in the end,” Magness said. Several teams were not happy with the bottlenecks on the course, as the teams were forced to stand and wait as the clock ticked. 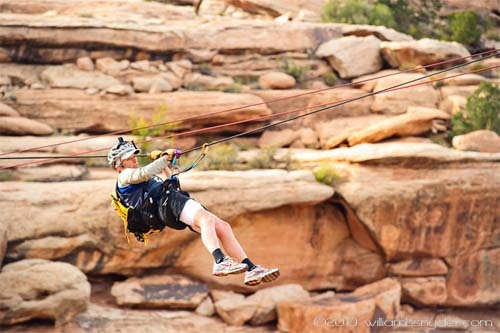 “It was perhaps not the best idea to have a rogaine section so early in the race lead into a ropes section that had a cutoff,” said Justin Bakken, captain of Team WEDALI, which won the USARA National Championship race in October, but placed 9th in Moab.